I tried two new recipes. I wanted a tastier sugar cookie so I tried the recipe found in The Flour Pot Cookie Book by Margie Greenberg. And, oh my goodness! They are delicious. I rolled them 1/8 inch thick (used paint stirrers for my levelers). Iced them with the Antonia 74 royal icing recipe posted on Cake Central. This is definitely the royal icing recipe I will use until someone can convince me otherwise! I also wanted a chocolate cookie for a dark background. I used the dark chocolate rolled sugar cookie recipe, also found on Cake Central. I didn't have any espresso powder. I used Hershey's Special Dark cocoa. They tasted AWESOME! I also rolled these 1/8 inch thick. They baked up nice and firm on the outside, but slightly soft on the inside. I found the Cherry Blossom tree cookie on Flickr! posted by Nancy's Fancy. These were simple and fun to do, but no where nearly as perfect as Nancy's! 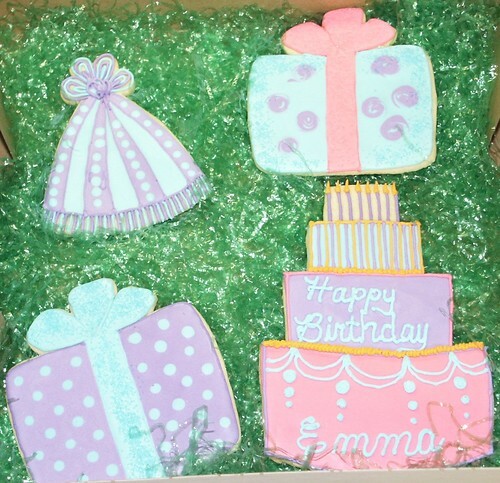 The birthday cookies were for my 8-year-old neighbor, Emma, whose favorite colors are purple and blue. I hand cut the cake cookie. It measures 7 1/2" x 5 1/2". The round cookies were just for fun! You can view more shots of these cookies and others in my C is for Cookie! set on Flickr!